Physicians are in constant need of data to make decisions. 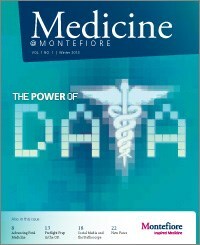 Montefiore is working to ensure that its staff has 24-hour access to cutting-edge analytics. Innovative techniques allow physicians to treat congenital disorders in utero. A checklist and coordination between team members can improve surgical outcomes. Social Media and the Stethoscope Social media is here to stay. How are physicians leveraging this communication tool? Social media is here to stay. How are physicians leveraging this communication tool? Leaders in the field discuss how Montefiore has contributed to the latest cardiac imaging guidelines and how the new protocols will impact care.